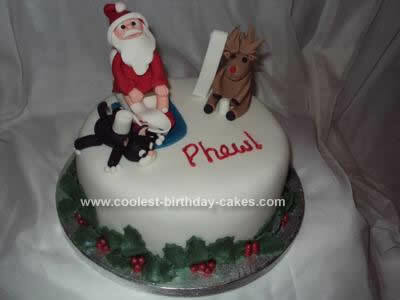 This Christmas Cake is slightly off the wall as the recipient requested I produce something funny but not TOO rude! I knew he liked cats and curries which led me to the idea of the Santa Sitting on the Loo theme as people eat a lot of turkey curry following the Christmas Day festivities. The cake is an 8″ rich fruit cake, I always use Delia Smith’s Traditional Christmas Cake recipe which is gorgeous whether iced and decorated straight away or made early to mature. I made all my fruit cakes in September and ‘fed’ them with brandy once a month up until two weeks before Christmas when they got iced and decorated. The cake is coated in almond paste and almond flavoured fondant. The models are made from fondant gum paste and were made a couple of weeks prior to use in order that they could set and dry properly. Birthday cake idea Posted by Christine M.